I'm back! Yes, that was quite a long absence from blogging. I've got to dedicate more time to this blog. However, I'm back with a review on the Antipodes Apostle Skin Brightening & Tone Correcting Serum. The 30ml bottle can be purchased for $59 at Myer, Priceline and adorebeauty (free shipping + they're fast!). "A water-based serum to help target pigmentation, brighten your skin and restore even tone. Waiwera mineral-blessed water helps restore essential moisture while delivering antioxidant-rich Vinanza Performance Plus to inhibit melanin production causing pigmentation. 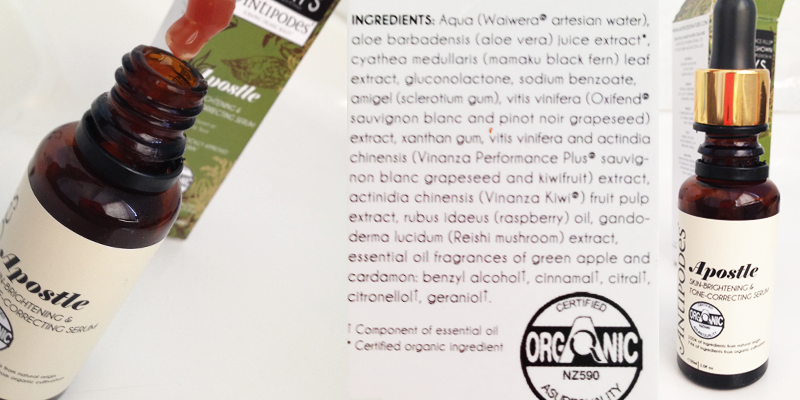 Vinanza Oxifend defends skin cells from oxidative stress helping reduce skin redness. Kiwifruit exfoliating enzyme renews your skin for true fresh-faced beauty." I use this serum in my morning skin care routine. It's water based and smells like berries. It smells so good! It really smells like I'm rubbing strawberries into my face. I use about 3 drops for my whole face and it sinks in real quick. It does leave a slight tight feeling so definitely need to moisturise after applying this serum. Antipodes states that this serum is dermatologically approved for sensitive skin and especially suitable for irritated skin. A lot of skin care products leave my skin a bit red/irritated, but this product doesn't. It's always hard to pinpoint which particular product is helping my skin when I use quite a few products. I can't say I looked in the mirror after 5 days of using this serum and noticed my skin was brighter. It takes more than a few days to see results. I've been using this serum since the start of this month, and have noticed that my skin tone is more even and I have less redness (especially around my nose). I only use it in the morning, so perhaps results would be better if I used it in my night time skin care routine too. It's not a miracle product but I do feel it's slowly helped my skin out. I've got at least 3/4 of the bottle left, so I predict this serum will last me another 2-3 months. Overall, I do like the Antipodes Apostle Skin Brightening & Tone Correcting Serum and would consider repurchasing once my bottle runs out. It smells like I'm rubbing strawberries into my face, is refreshing and I believe it's slightly improved my skin over time. It gets a thumbs up from me! 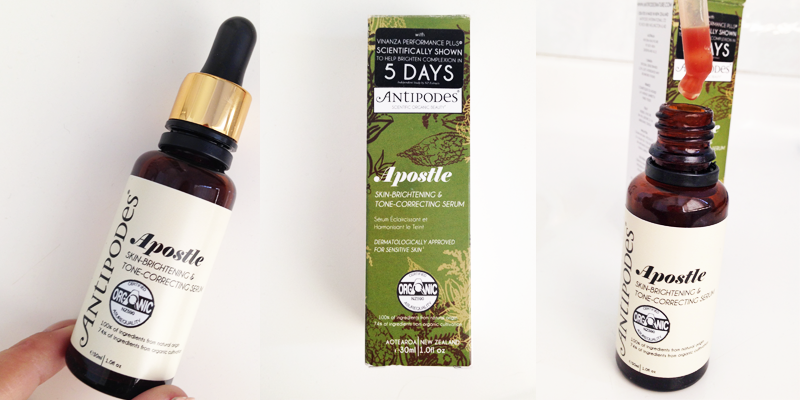 Have you tried any Antipodes products? Do you use a serum in your morning skin care routine? Are you after a sonic cleansing brush, but don't want to totally empty out your wallet? I've got you covered! 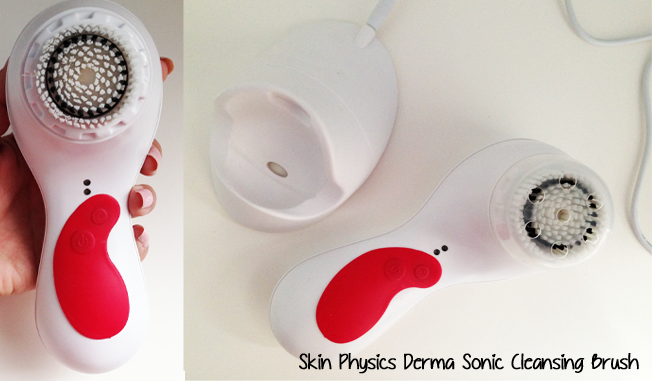 Meet the Skin Physics Derma Sonic Cleansing Brush, which can be purchased for $100 at Priceline (in Australia). Whilst it's not super cheap, it's more affordable than the highly praised Clarisonic brushes and it also uses sonic technology. I finally caved in to all the cleansing brush hype, and purchased this sonic cleansing brush. 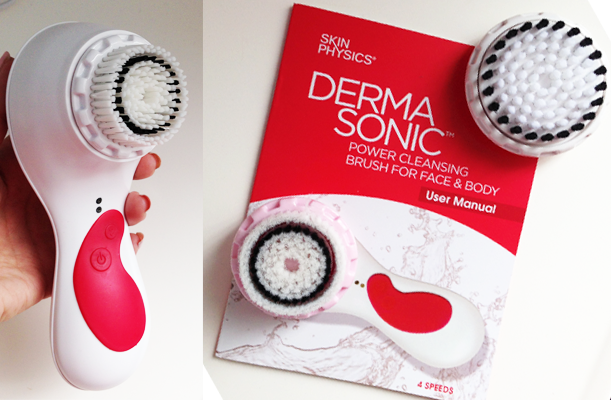 The Skin Physics Derma Sonic Cleansing Brush comes with a regular brush head (pictured attached), a sensitive brush head and a body brush head. It has 4 speed settings for facial cleansing, which are visibly indicated by the light/s on the brush. This is awesome, as I can adjust it depending on how my skin is each day. Additionally, it has a constant mode and pulse mode for body cleansing. It doesn't have a timer or notify you when a certain amount of time has elapsed, which doesn't bother me as I don't find that necessary. It comes with a charging cradle, which makes me extremely happy as I hate having to buy batteries. I better mention that it's waterproof too, so it can be used in the shower. Skin Physics claims that this brush removes 6 times more makeup than manual cleansing, minimises the appearance of visible pores, and leaves skin softer and smoother. I have to say that it does live up to these claims! The main reason I purchased this brush was to minimise the appearance of pores. I've always been paranoid about visible pores on my nose. No cleanser/exfoliator did a good enough job cleaning them out and minimising their appearance, so I was really hoping that this brush could help me out. I'm very pleased to report that it has minimised the appearance of pores on my skin! Whilst they aren't completely invisible now, there has definitely been a noticeable reduction in their appearance and for that reason alone this device was a worthwhile purchase. I've got combination skin, so dry patches aren't a rare occurrence for me. I love to use this brush in the mornings to get rid of them and prepare my skin for the rest of my morning routine. If you've got dry skin, you know how hard it is to apply any sort of make up on flaky skin (gross, I know). This brush also helps in brightening my skin, as you would expect as it exfoliates the skin. So basically, the Skin Physics Derma Sonic Cleansing Brush has produced visible results and I ❤ it. Do you use a cleansing brush? If not, has all the recent hype got you interested in purchasing one?